Why are some nations more prosperous than others? Is it because the wealthier nations exploit the poorer ones, keeping them poor? Or are there certain policies, laws, and cultural beliefs that lead to prosperity? 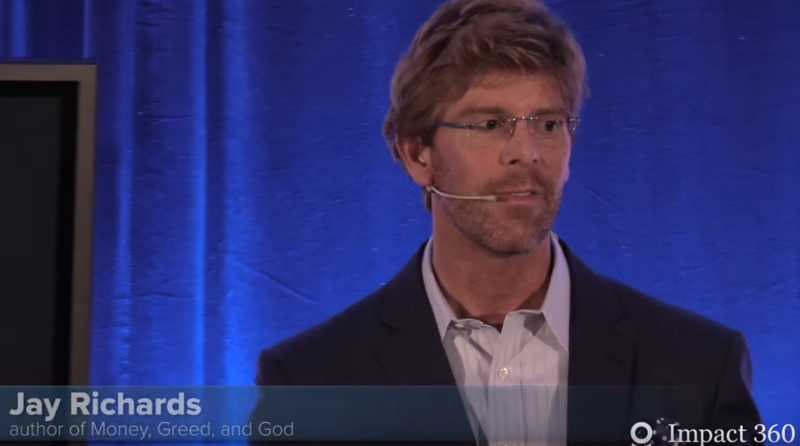 Dr. Jay Richards delivers a lecture for Impact 360, in which he identifies 10 different factors that lift nations out of poverty, and explains why they work. Establish and maintain the rule of law. Focus the jurisdiction of government on maintaining the rule of law, and limit its jurisdiction over the economy and the institutions of civil society. Implement a formal property system with consistent and accessible means for securing a clear title to property one owns. Encourage economic freedom: Allow people to trade goods and services unencumbered by tariffs, subsidies, price controls, undue regulation, and restrictive immigration policies. Encourage stable families and other important private institutions that mediate between the individual and the state. Encourage belief in the truth that the universe is purposeful and makes sense. Encourage the right cultural mores—orientation to the future and the belief that progress but not utopia is possible in this life; willingness to save and delay gratification; willingness to risk, to respect the rights and property of others, to be diligent, to be thrifty. Instill a proper understanding of the nature of wealth and poverty—that wealth is created, that free trade is win-win, that risk is essential to enterprise, that trade-offs are unavoidable, that the success of others need not come at your expense, and that you can pursue legitimate self-interest and the common good at the same time. Focus on your comparative advantage rather than protecting what used to be your competitive advantage. Solving economic problems is just like solving any other problem. First, we read to learn what has been proven to work. Then, we do what works. I want to encourage Christians to move beyond good intentions to good results when voting for economic policies. Often, people on the left want to “fix” inequalities by doing what feels good to them, or what sounds good to them. Economics is about choosing policies that we know have worked in other times and places. Let’s talk more about #4 from Richards’ list. Consider the book “The Poverty of Nations: A Sustainable Solution” by famous conservative theologian Wayne Grudem. In a presentation of his new book at the Family Research Council, biblical theologian Wayne Grudem argued that poor countries can become rich only by producing their own prosperity, and that the free market is not only the economic answer, but in tune with the Bible’s moral teachings. […]Grudem argued that the wealth of a country is determined by its per-capita income – the average amount of money each citizen makes. The only way to increase this is to increase the production of goods and services, creating more wealth for everyone, he said. […]The professor pointed to 79 factors to help a country produce more goods and services, in three different key areas: the economic system, government, and cultural beliefs and values. For the economic system, Grudem mentioned the Index of Economic Freedom, a report put out by the Heritage Foundation to judge each country’s openness to trade and wealth creation. You can find the Heritage Foundation Index of Economic Freedom right here. Take a look at the countries at the top… these countries also have a very high per capita income. Their citizens are earning a lot of money by selling what they produce to willing customers. The ones at the bottom are run by socialist governments. You wouldn’t want to try to make a living in Venezuela or Cuba or North Korea. But these are the places that American socialists admire and support. Does that tell you something about what they would do to you, if they got hold of the reins of government? Countries in the top quartile (25 per cent) of economic freedom (such as the U.K., Japan and Ireland) had an average per-capita income of US$40,376 in 2016 compared to US$5,649 for the bottom quartile countries (such as Venezuela, Iran and Zimbabwe). And life expectancy is 79.5 years in the top quartile of countries compared to 64.4 years in the bottom quartile. Previous PostVideo, audio and summary of intelligent design discussion, with Ben Shapiro and Stephen C. MeyerNext PostIs it the man’s responsibility to pursue the woman, or the other way around? It’s never about the attitudes and culture of the country…. Only the white man’s or the West’s fault for the Left. Keeps their victimhood narratives going! Having politicians solve an issue when everyone generally agrees politics self corrupt is the big problem I have with the left. And they want to create a gov’t too big to fail. Wintery Knight hooked me up with this. Men, this applies to you especially. It is time to build your way out of the hole and into the normal part of society.